I'm not really into submarines. Airplanes are my thing. But when I found a second printing of The Hunt for Red October in a local thrift store last month, I just had to have it. 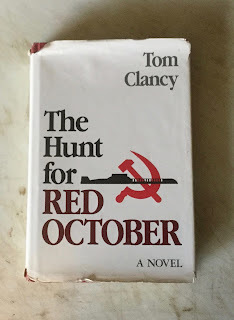 I've seen the movie, The Hunt for Red October, but I have yet to read the book. It is now high up on my reading pile. This particular copy of the book is rather unique. Its former owner, a submariner by the name of Jim Cochran, extra-illustrated it! 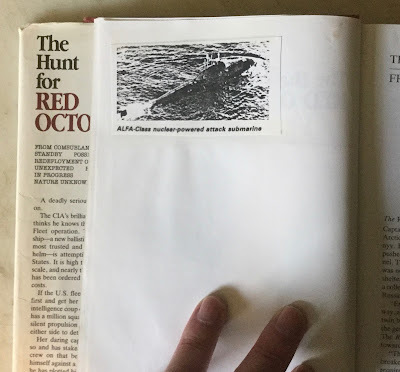 On the front free endpaper, he pasted an image of an American submarine with two sailors standing in the conning tower. 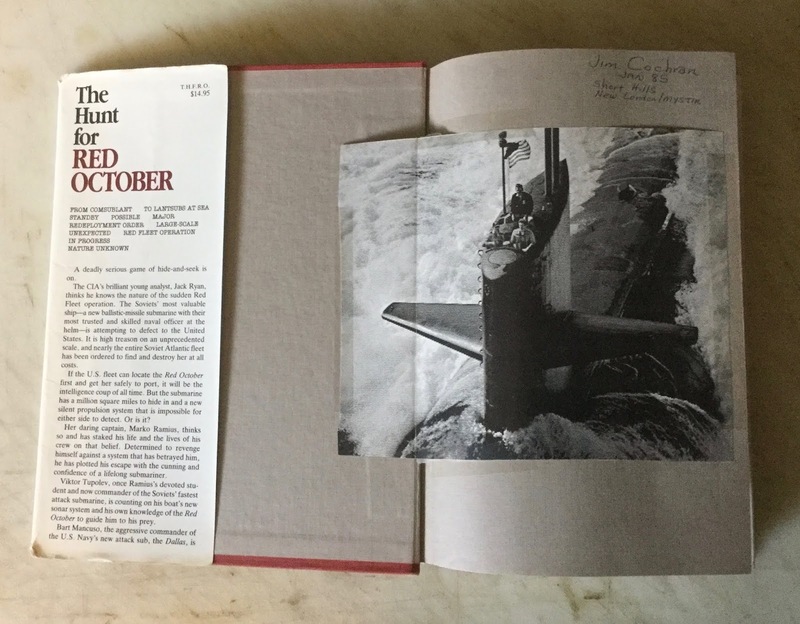 On the verso of the front free endpaper, he pasted an image of a submarine with three crew members standing in its conning tower. On the title page, he pasted an image of Severodvinsk, the world's largest submarine production yard. 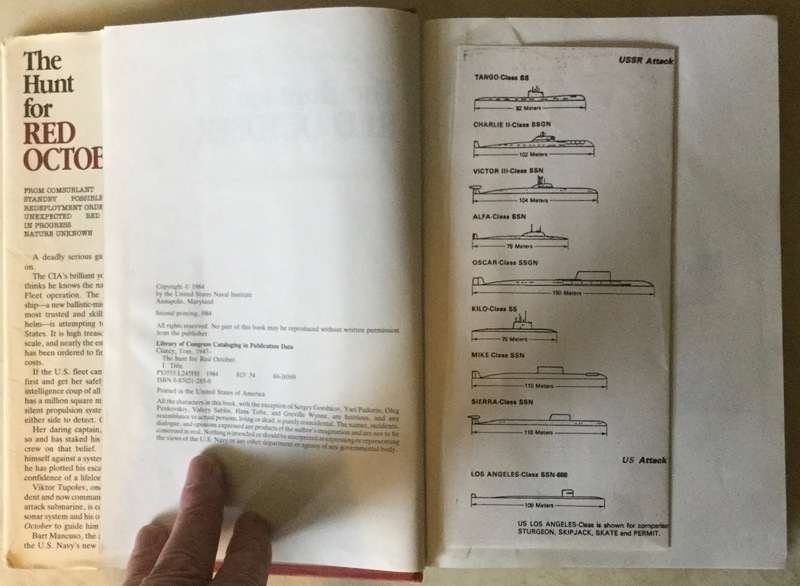 On the dedication page, he pasted a chart depicting the USSR attack submarines. 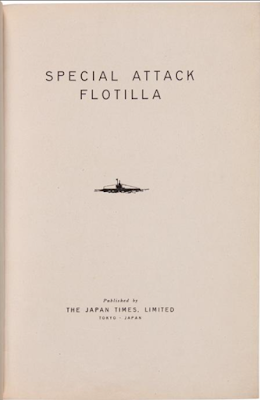 On the half title page, he pasted an image of the Typhoon Class submarine. And on the verso, he pasted an image of the ALFA-Class nuclear-powered attack submarine. 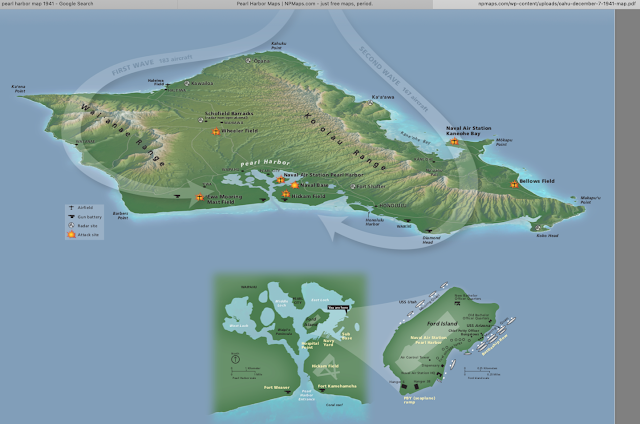 I have a sentimental attachment to Hawaii and its military bases. From 1977 to 1982, I fixed airplanes at Hickam Air Base, the navigation and RADAR Systems of C-141 and C-5A aircraft to be exact. 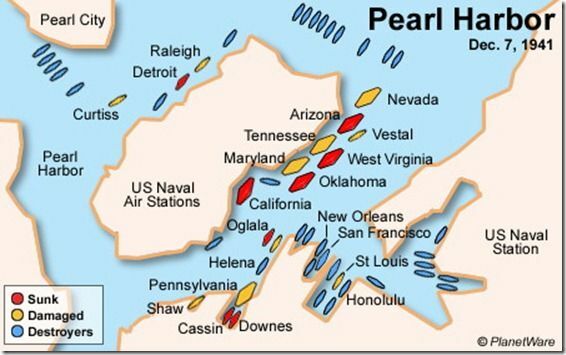 Hickam Air Base is adjacent to Pearl Harbor. My shop was located in a hangar across the street from Pacific Air Forces (PACAF) Headquarters. Sometimes when I went to work early in the morning, I would pause and look at the PACAF building across the street. 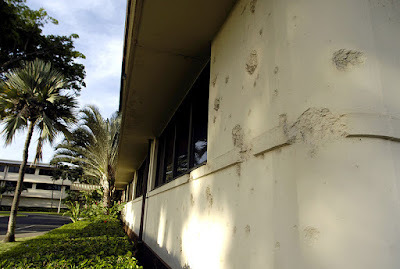 They never repaired the bullet holes and shrapnel damage done to the building, leaving them as reminders of December 7, 1941, the day the Japanese attacked Pearl Harbor. Kazuo Sakamaki was not one of the Japanese Zero pilots who bombed Pearl Harbor. He was the skipper of one of Japan's top secret weapons: five midget submarines. 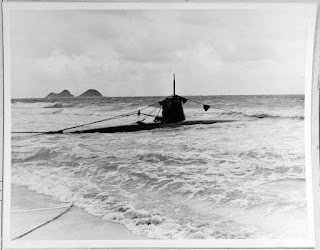 The midget submarines were transported across the ocean attached to mother submarines and released several miles from the entrance to Pearl Harbor (the Harbor was too shallow for the mother submarines). Each midget submarine carried two torpedoes and was manned by a two-man crew. The mission of the sailors of the midget submarines was to sneak into Pearl Harbor under cover of darkness, remain submerged near the bottom until daylight, and then join the aircraft in attacking the American fleet. Ensign Kazuo Sakamaki wanted to sink the USS Pennsylvania, the flagship of the Pacific Fleet. But before he launched his midget submarine, he discovered that his gyrocompass was inoperative. Nevertheless he and his aide continued on their mission. Navigating blindly, he never got through the entrance into Pearl Harbor. Twice his midget submarine got stuck on reefs, damaging a torpedo the first time, and damaging the torpedo release mechanism the second time, rendering the second torpedo useless as well. 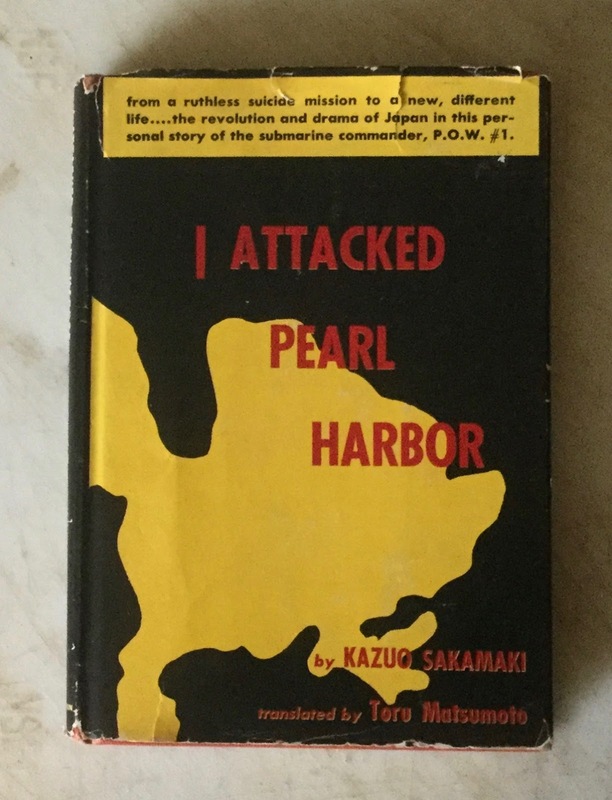 Sakamaki was knocked unconscious by depth charges dropped by destroyers protecting the entrance to Pearl Harbor and his midget submarine drifted for hours all the way to the east side of the island, finally getting stuck on a coral reef near Bellows Beach. He and his aide lit the fuse to destroy the sub and started to swim towards the beach. Sakamaki's aide drowned trying to reach the beach. Even worse, there was not an explosion, and his midget submarine was not destroyed. The next thing Sakamaki remembers is waking up on the beach at Bellows with an Army Sergeant standing over him. Ensign Kazuo Sakamaki was POW No. 1. Located on the windward side (east side)of the island of Oahu, Bellows currently serves as a military training station and as a recreation area for active duty and retired members of the armed forces. The Marines own half of Bellows and practice amphibious landings. The Air Force runs the recreation side of Bellows with cabins and even a motel. 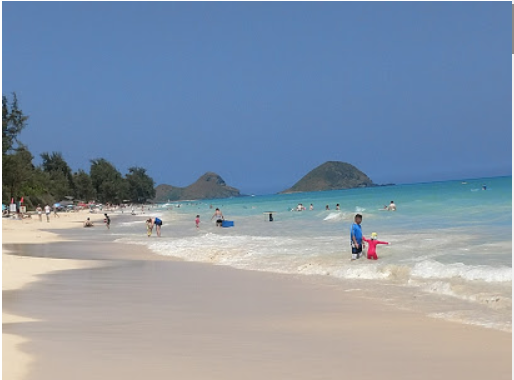 If we weren't vacationing at Bellows and renting a cabin for a week or two, we would be on the beach at Bellows almost every weekend. Our kids would swim for a few hours, and then my wife and I and our friends Manny and Joyce would grab our boogie boards and ride the waves! Here's an image of what Bellows Beach looked like on December 8, 1941, when they pulled Sakamaki's minisub off the reef and onto the shore. Most of the remainder of Sakamaki's book is his recollection of his four years as POW No. 1. He was treated extremely well by his American captives at several camps and in accordance with the Geneva Convention. Sakamaki soon began to brief new arrivals to the prison camp. He stressed that the camp was not a battlefield and they were no longer combatants. This philosophy went against Japanese tradition: Do battle to the end. Commit harakiri instead of surrendering. 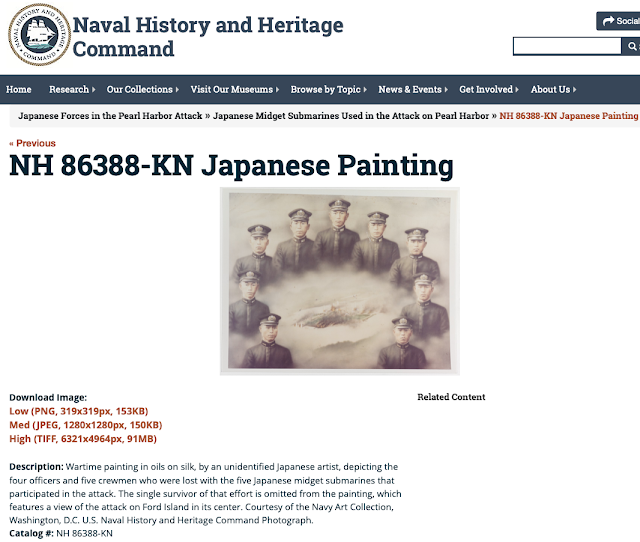 The Japanese painting below honors the nine sailors of the midget submarines that attacked Pearl Harbor. Noticeably absent in the painting is the lone survivor, Ensign Kazuo Sakamaki, POW No. 1. Sakamaki's book was first published in 1949 by Association Press. 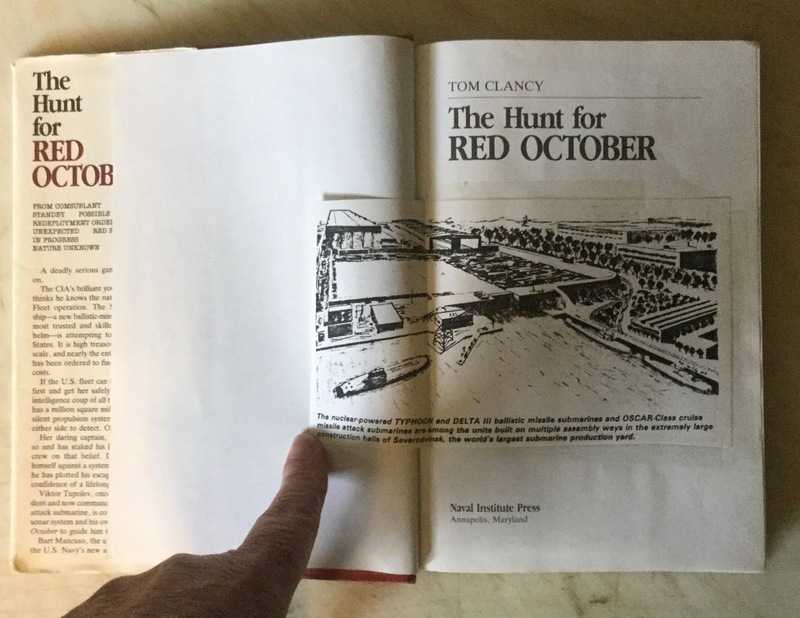 And Rollston Press published a softcover edition in 2017. 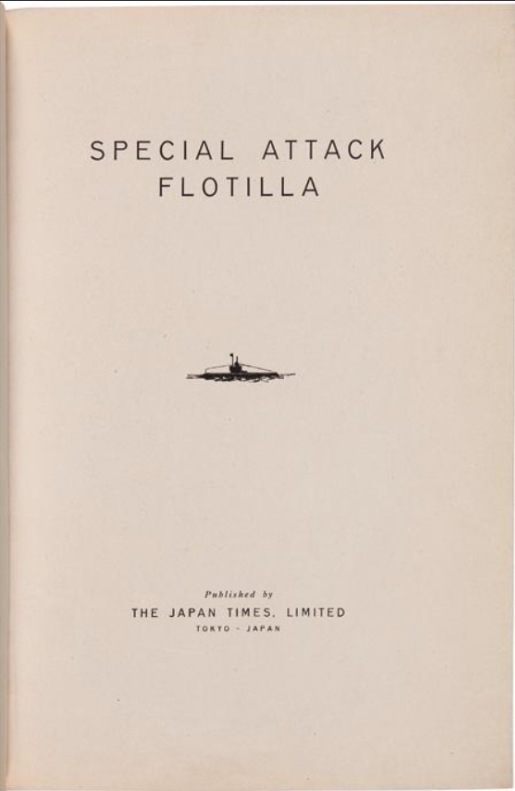 Sakamaki's book wasn't the first book about the midget submarines and their crews to be published. In 1942 the Japan Times published a memorial volume to the nine sailors who died during the attack on Pearl Harbor. The book was published in English, most likely for propaganda purposes. I first heard of this book in 2002. 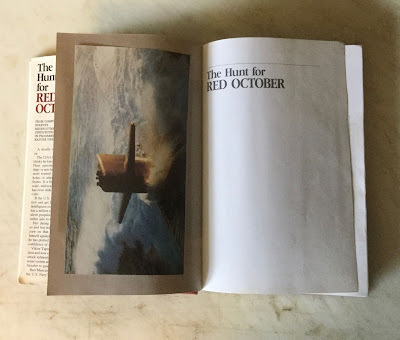 My bookseller friend David Holloway bragged on the rec.collectingbooks newsgroup that he had acquired a copy. Dave eventually sold it for close to $1000 dollars (too rich for me). Rare Book Hub shows three copies sold at auction in the last six years. Currently, there is a copy listed on eBay for a whopping $8,500! Earlier I mentioned that I wasn't really into submarines. But the midget submarine attack on Pearl Harbor was getting all the more interesting the more I researched and read about it. I wondered what happened to the other four midget submarines. And I found a book that told me all about them! 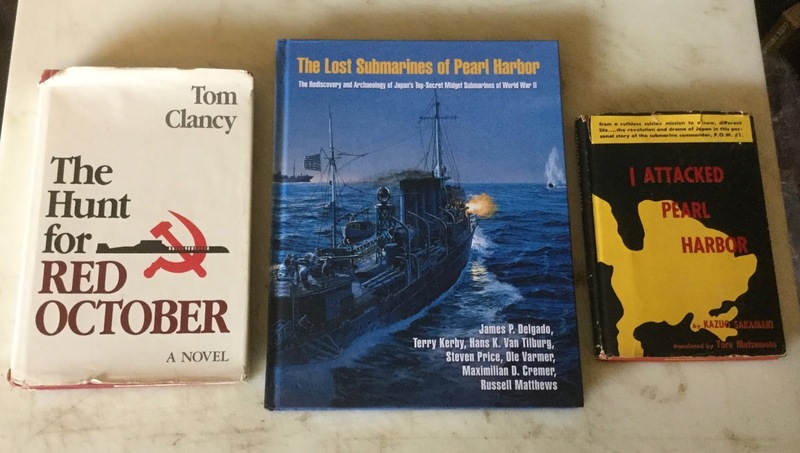 Numerous books have been written about the midget submarines and the attack on Pearl Harbor. 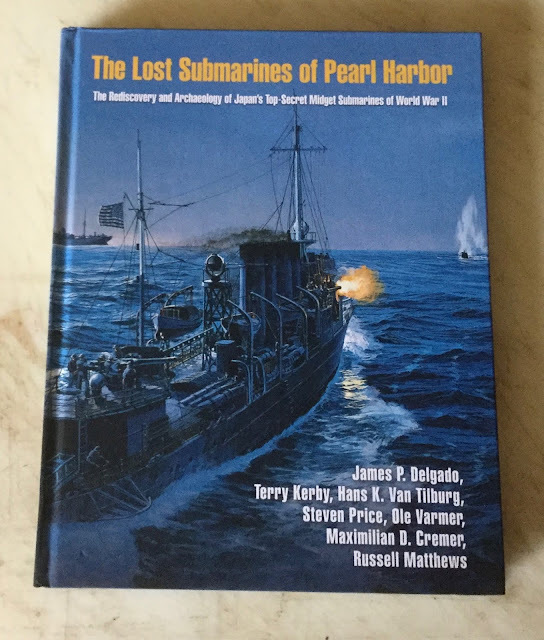 This book, The Lost Submarines of Pearl Harbor, first published in 2016, tells all. And with pages and pages of illustrations. The midget submarines originally received credit for sinking the Arizona. But that is not the case. Not one of the midget submarines inflicted any damage to a Navy vessel in Pearl Harbor. 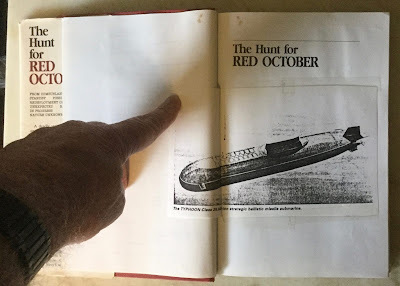 The editors of this book tracked all five of the midget submarines from their launches to when their hulls were finally recovered. The midget submarine that the USS Ward sank ( "the First Shot of the War,") wasn't recovered until 2002. Sakamaki's midget submarine HA-19, was restored and dispatched on a War Bonds Tour across the country in 1942 and 1943. It is now in the National Museum of the Pacific War (Admiral Nimitz Foundation) in Fredericksburg, Texas. Sakamaki visited the museum in 1991, and saw his midget submarine for the first time in fifty years. As POW No. 1 Sakamaki received much publicity upon his return to Japan. Japanese men wrote him and said there was still time for him to do honor and commit harakiri. Women were attracted to him. He initially shunned publicity, quietly married, and worked in an automobile manufacturing plant. His book, I Attacked Pearl Harbor, is now joined in my library by The Hunt for Red October and The Lost Submarines of Pearl Harbor. Finally, I'll end this post with a postscript of memories related to other ex-POWs. I was stationed at Scott AFB, Illinois from 1970 to 1974. My wife and I were on the tarmac at Scott AFB to greet the ex-POWs from Vietnam when they returned home on a C-141A Starlifter in 1973. I get tears in my eyes remembering it all now. And more memories: Three of my four children were born at Scott AFB. My wife's OB/Gyn nurse Capt. Kazmar and I were singing Polish Christmas Carols in July or August of 1972 while my wife was having contractions with the twins! I heard later that the Captain switched from OB/Gyn to taking care of the ex-POWs in 1973. She married one of them! Fascinating, Jerry. My mother, older brother and I were at Pearl Harbor about six months before the attack, on our way from Japan to the U.S. We spent several weeks there as my Grandfather had been a professional soldier, and died in Japan in 1935. I guess we were lucky to have left before December 7th.